Christensen (1987) points out that the importance of a “good fit” between humans and tools was probably realized early in the development of the species. Australopithecus Prometheus selected pebble tools and made scoops from antelope bones in a clear display of selecting/creating objects to make tasks easier to accomplish. It seems that the history of ergonomics goes back as far as humans do. In the work environment, the selection and creation of tools, machines, and work processes continued. Over centuries, the effectiveness of hammers, axes and plows improved. With the Industrial Revolution, machines such as the spinning jenny (a machine that produced yarn to make cloth) and rolling mills (a method of flattening iron ore into flat sheets) were developed to improve work processes. This is the same motivation behind much of ergonomics today. Wojciech Jastrzebowski created the word ergonomics in 1857 in a philosophical narrative, “based upon the truths drawn from the Science of Nature” (Jastrzebowski, 1857). In the early 1900’s, the production of industry was still largely dependent on human power/motion and ergonomic concepts were developing to improve worker productivity. Scientific Management, a method that improved worker efficiency by improving the job process, became popular. Frederick W. Taylor was a pioneer of this approach and evaluated jobs to determine the “One Best Way” they could be performed. At Bethlehem Steel, Taylor dramatically increased worker production and wages in a shoveling task by matching the shovel with the type of material that was being moved (ashes, coal or ore). Frank and Lillian Gilbreth made jobs more efficient and less fatiguing through time motion analysis and standardizing tools, materials and the job process. By applying this approach, the number of motions in bricklaying was reduced from 18 to 4.5 allowing bricklayers to increase their pace of laying bricks from 120 to 350 bricks per hour. World War II prompted greater interest in human-machine interaction as the efficiency of sophisticated military equipment (i.e., airplanes) could be compromised by bad or confusing design. Design concepts of fitting the machine to the size of the soldier and logical/understandable control buttons evolved. Areas of knowledge that involved human behavior and attributes (i.e., decision making process, organization design, human perception relative to design) became known as cognitive ergonomics or human factors. Areas of knowledge that involved physical aspects of the workplace and human abilities such as force required to lift, vibration and reaches became known as industrial ergonomics or ergonomics. The broad group focus and name duality continues at this time. Contributors to ergonomics/human factors concepts include industrial engineers, industrial psychologists, occupational medicine physicians, industrial hygienists, and safety engineers. 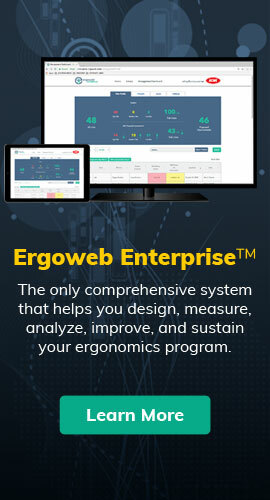 Professions that use ergonomics/human factors information include architects, occupational therapists, physical therapists, occupational medicine nurses, and insurance loss control specialists.